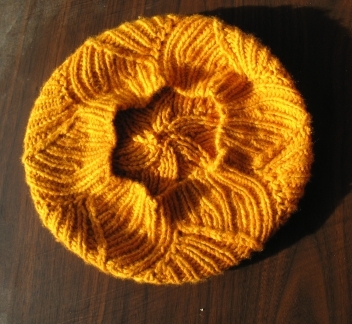 Available via the Ravelry page, or click here to . 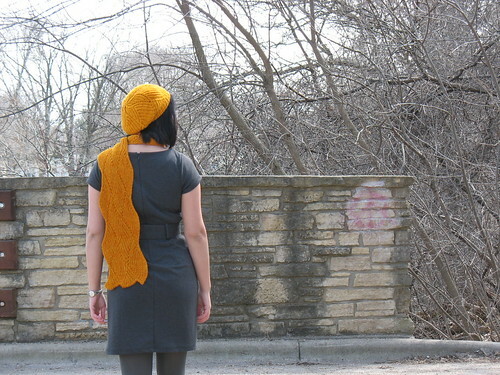 The pattern PDF includes instructions for both the hat and the scarf, both charted and written. 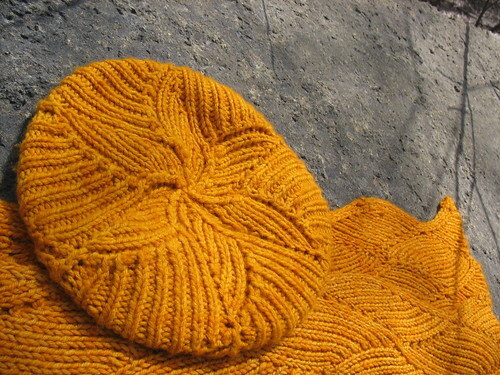 From pattern description: “This slouchy ribbed beret, with its brilliant orange-yellow color and swirling star pattern on the top, is the most sunny, cheerful piece of clothing I own—just the thing to chase away the winter doldrums or usher in the return of spring. It takes less than one skein of Malabrigo Twist, and with just knits, purls, increases, and decreases, it can be knit up in just a few days. Note that the natural inclination of the ribbing is to compress greatly, so the hat will be snug and beanie-like until blocked. Don’t worry! It will take on its slouchy shape after being wet-blocked over a dinner plate. The matching reversible scarf pattern, based on Barbara Walker’s Flame Rib pattern, uses increases and decreases to form a gently undulating shape; knit up with two skeins of Malabrigo Twist, it’s wide and somewhat short, a good length to wrap around the neck once and tuck into a coat. I prefer it with the ribs left compressed for a thick and cozy texture, but you can also block the ribbing out wider to match the look of the hat. TECHknitting, My Fashionable Life, Knitty, Fluffbuff, and Knitting Daily (video). TECHknitting, Cmeknit, Savannahchik, and Crankygrrrrrl. Just found your blog – following your lovely hat and scarf set – and am really enjoying reading it! What a great colour – like warm sunshine. The racking pattern reminds me of the sun’s rays. OMG I love this color! I’d love to stripe it with black for some Hufflepuff socks.